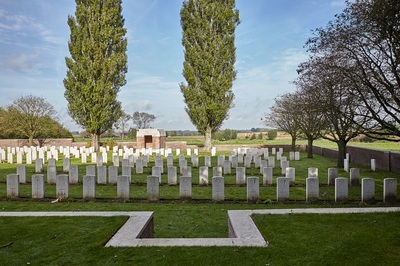 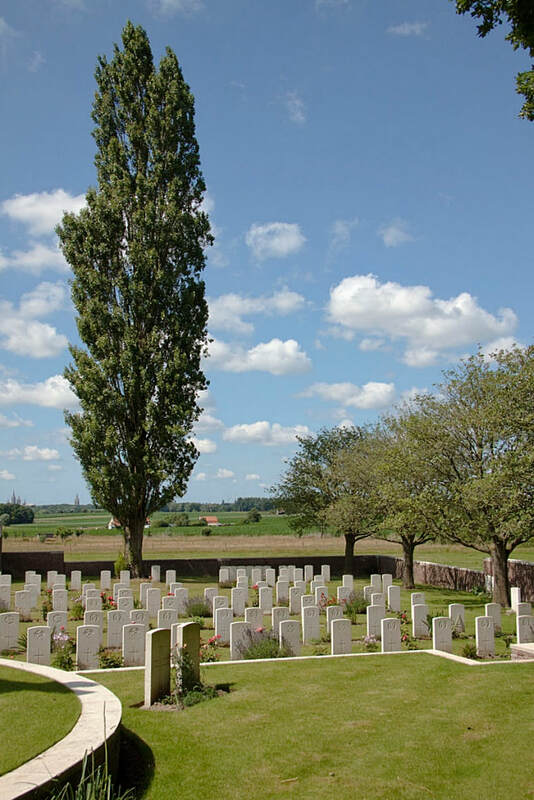 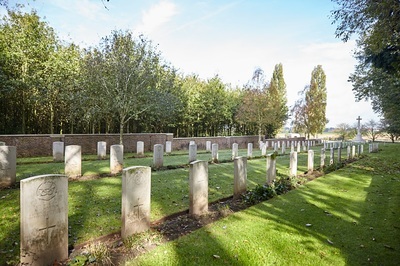 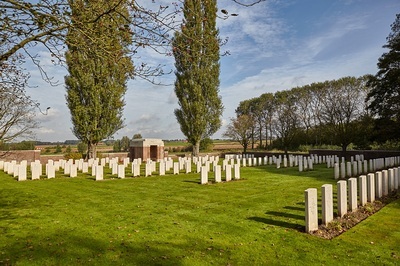 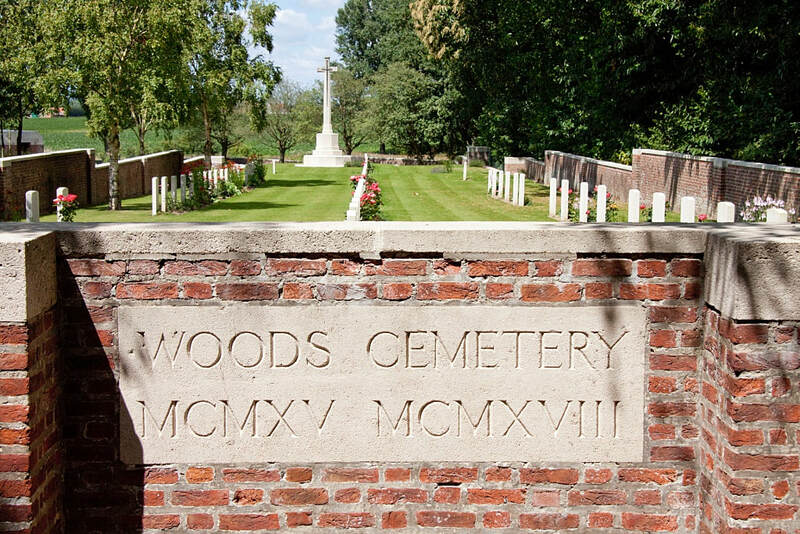 Woods Cemetery is located 4 Kms south-east of Ieper town centre, on the Verbrandemolenstraat a road leading from the Komenseweg, connecting Ieper to Komen (N336). 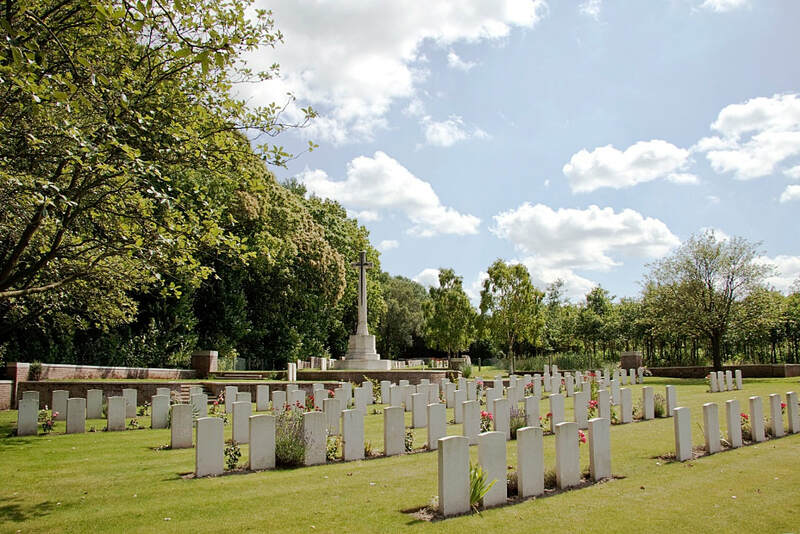 From Ieper town centre the Komenseweg is located via the Rijselsestraat, through the Rijselpoort (Lille Gate) and crossing the Ieper ring road, towards Armentieres and Lille. The road name then changes to Rijselseweg. 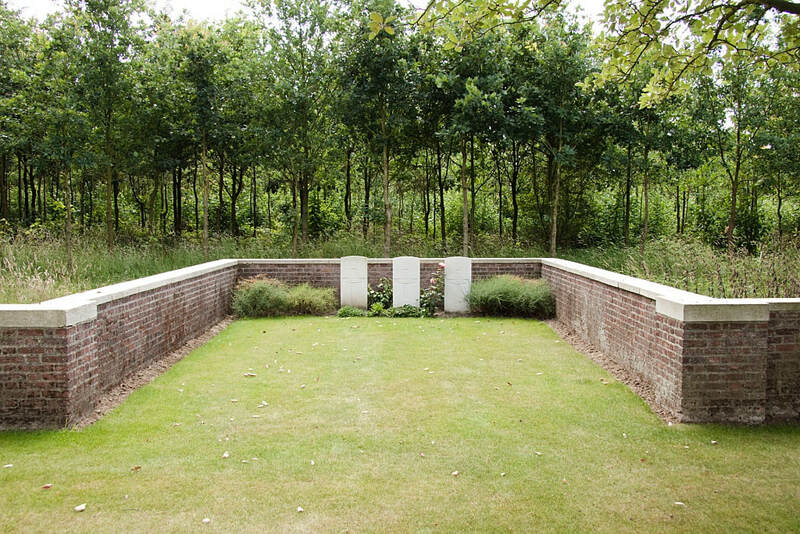 1 Km along the Rijselseweg lies the left hand turning onto Komenseweg. 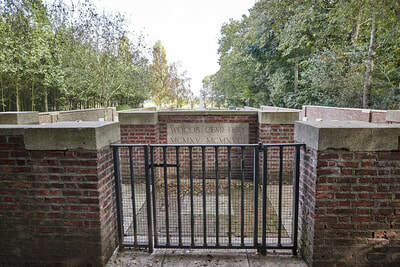 2.5 Kms along the Komenseweg lies the right hand turning onto the Vaartstraat. 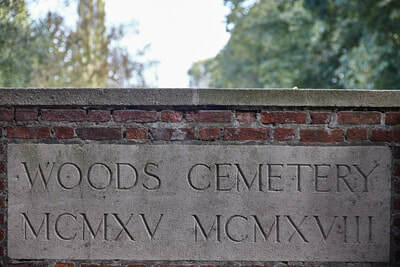 900 metres along the Vaartstraat lies the left hand turning onto the Verbrandemolenstraat. 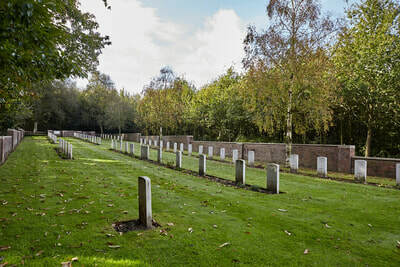 400 metres along the Verbrandemolenstraat a short distance from the road is the cemetery. 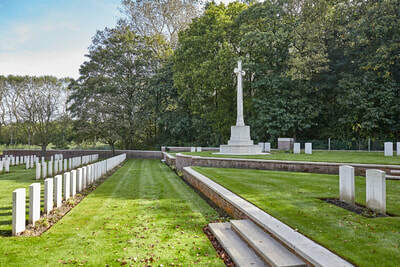 Visitors to this site should note the 100 metre grassed access path leading to the cemetery is not accessible by vehicle. 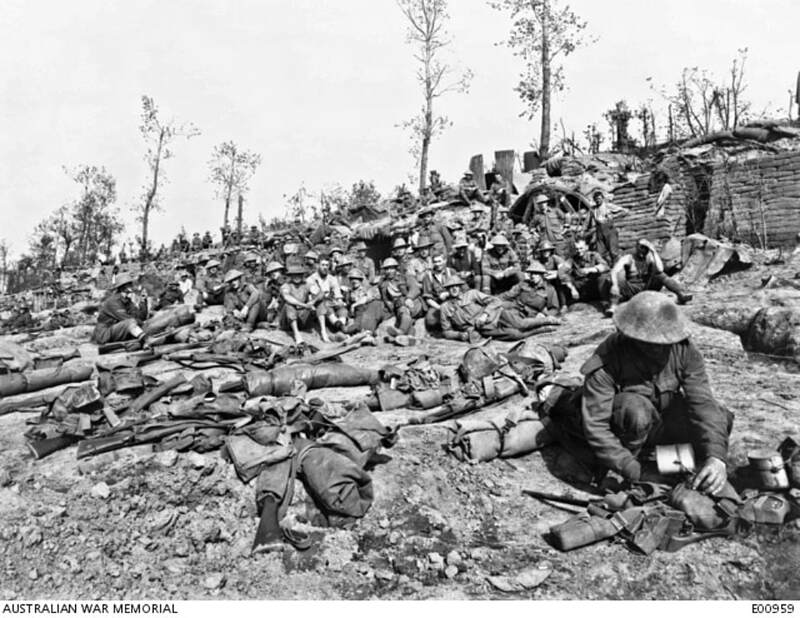 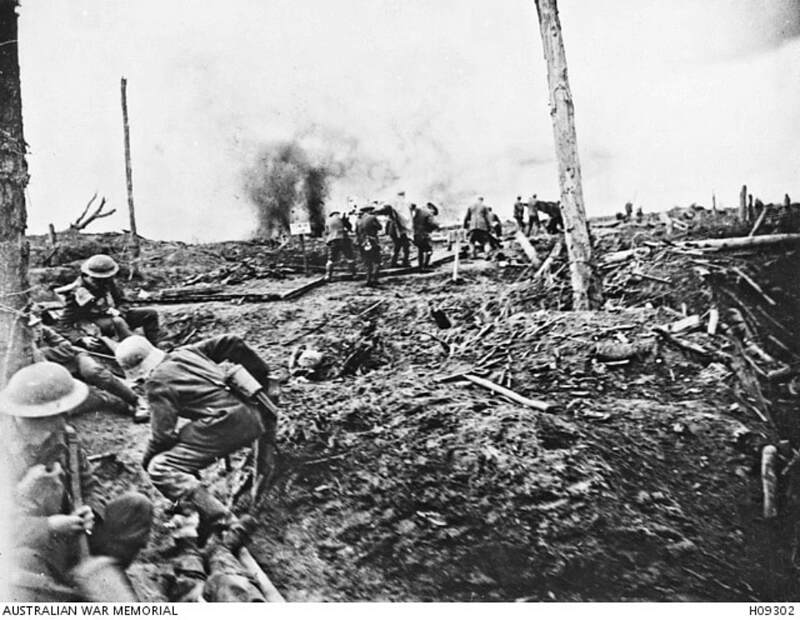 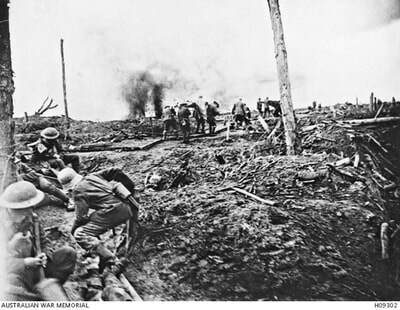 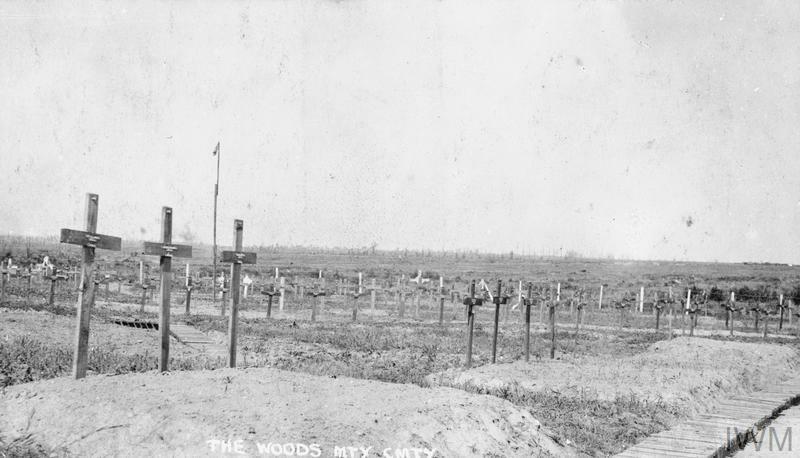 Woods Cemetery was begun by the 1st Dorsets and the 1st East Surreys in April 1915; it was used until September 1917 by units holding this sector, and by the field ambulances of their divisions. 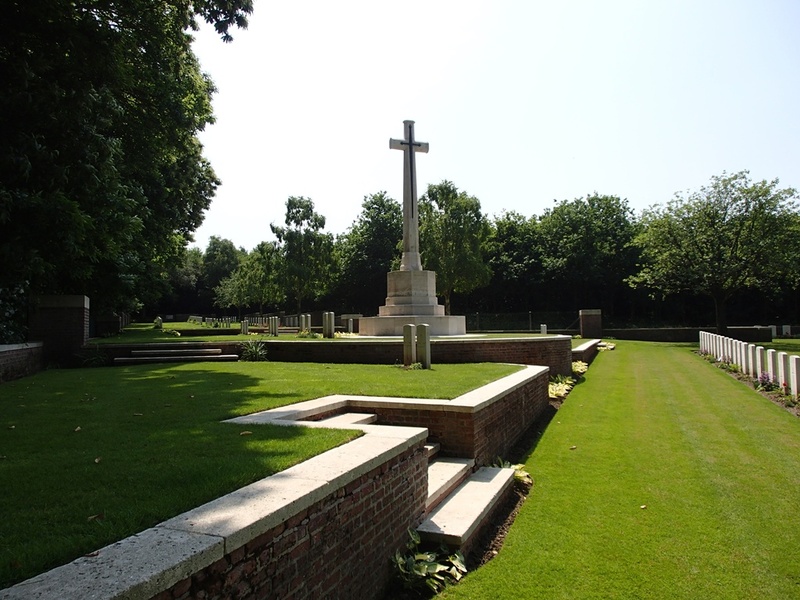 The graves of the 2nd, 3rd and 10th Canadian Battalions and the London Regiment are particularly numerous. 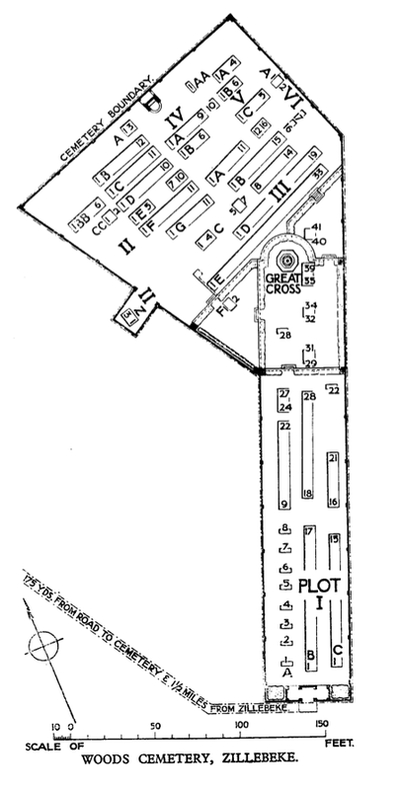 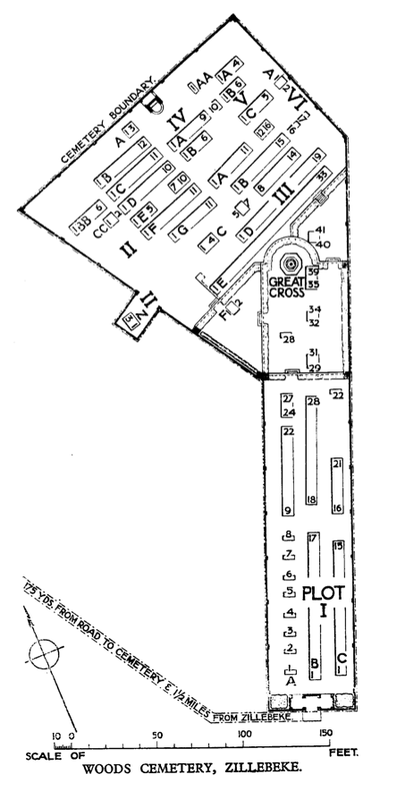 The irregular shape of the cemetery is due to the conditions of burial at the times when the front line was just beyond the wood. 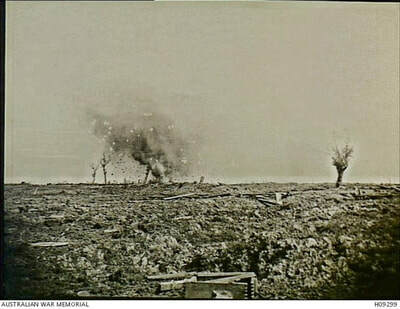 The views over the battlefield are extensive. 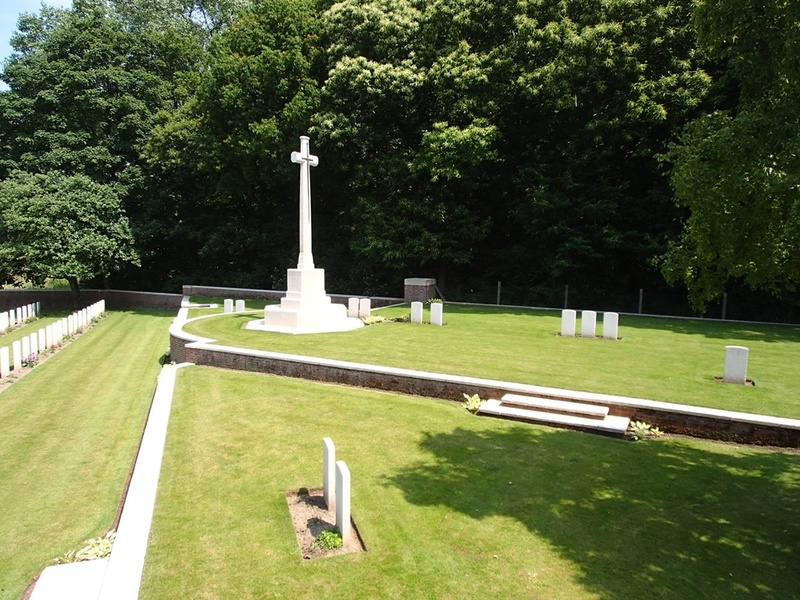 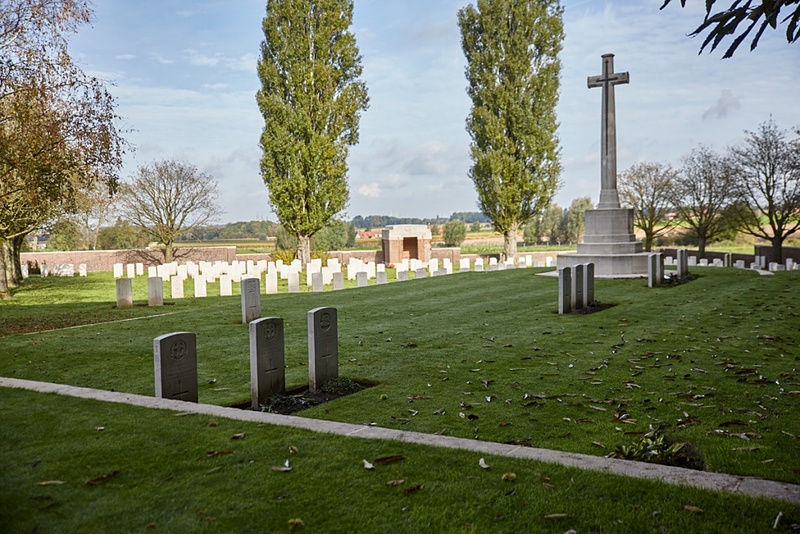 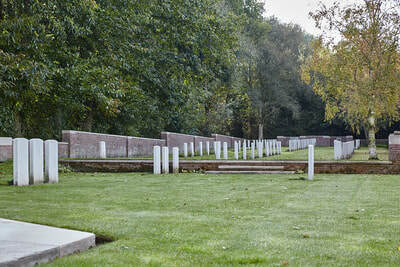 Woods Cemetery contains 326 First World War burials, 32 of them unidentified. 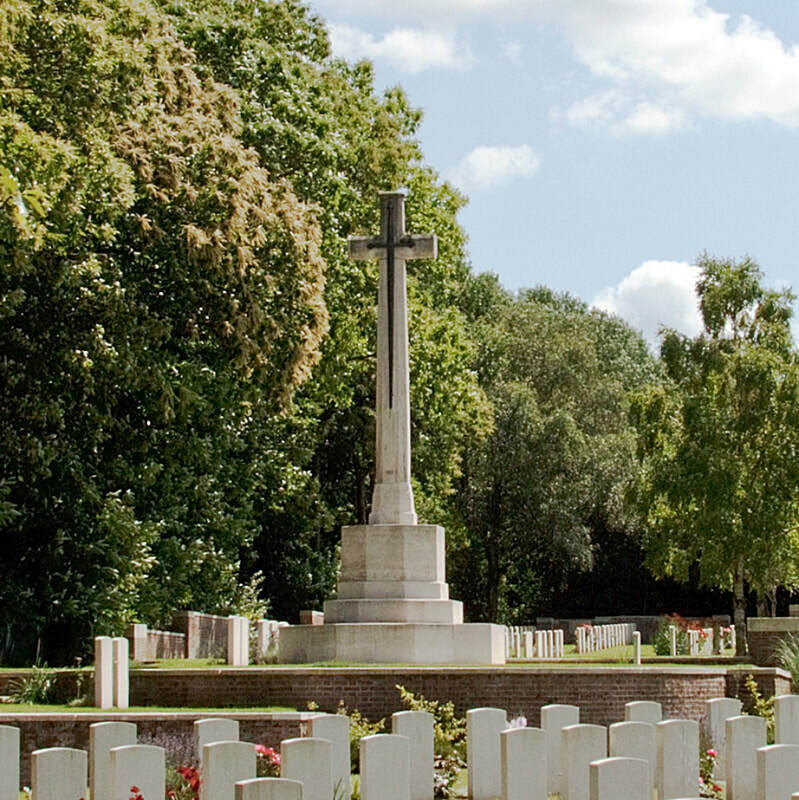 Son of Mrs. A. M. Garrett, of 174, Town Rd., Lower Edmonton, London. 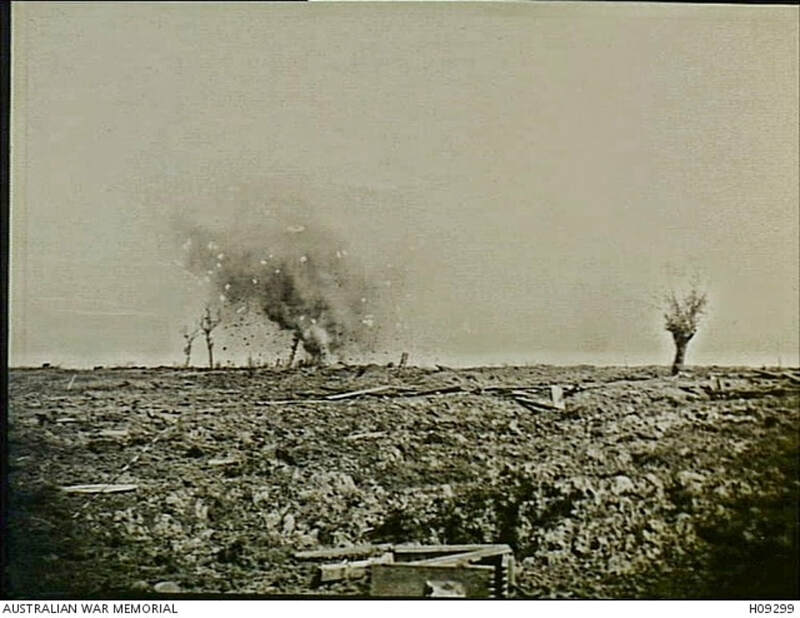 11th September 1916, aged 34. Son of Thomas and Elizabeth McKinley; husband of Jennie McKinley, of 3, Bruce St., Brunswick, Victoria, Australia. 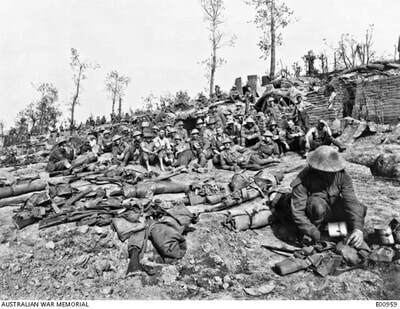 Native of Tasmania.